Home / baseball / Buffalo / Buffalo Bisons / buffalo wings / CM / Daily Update / MiLB / Sports / FREE Bisons ticket with purchase of 'Buffalo Wings' cap! 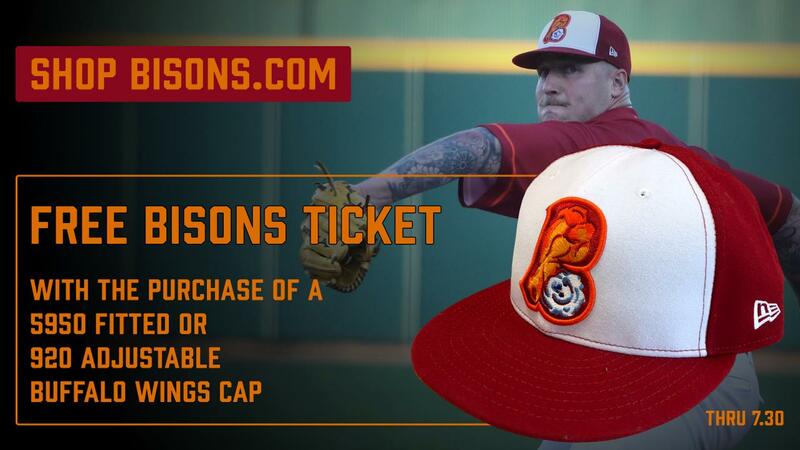 FREE Bisons ticket with purchase of 'Buffalo Wings' cap! BUFFALO, N.Y. -- Don't wait any longer to show your pride for Buffalo's favorite hometown team and meal, because we're serving up a great offer right now at Bisons.com. 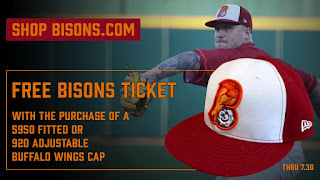 Now through July 30, you can receive a FREE Bisons ticket for any game this July when you purchase a Buffalo Wings' 'B' cap online or at the Coca-Cola Field gift shops. There are two great options to choose from. You can get the New Era 5950 Cap for only $32.99, the same cap the team wore on the field when they took on the Rochester Plates for food supremacy! CLICK HERE to get yours. This offer is also good for the New Era 920 Adjustable Cap, for only $24.99. CLICK HERE to get yours. Whichever one you choose, if you order by Monday, July 30, we'll include a ticket voucher for a free ticket to any of the remaining games in July. Just don your favorite new cap and take the voucher to the Coca-Cola Field Box Office to redeem your ticket. And while you are shopping, check out all the great Buffalo Wings merchandise that is available on Bisons.com (CLICK HERE). These great caps, tees, hoodie's and quarter-zips all have limited supplies remaining and are going fast! Orders Up....get your Buffalo Wings' gear today!